BNI of the Heartland: HELLO ... CAN YOU HOLD PLEASE? 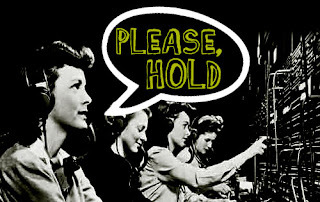 HELLO ... CAN YOU HOLD PLEASE? For the most part I am a positive person. The goals for my blogs are to share stories and give good advice. This blog has stories and advice, and I am going to talk about something most of us are guilty of, and it can drive your clients, business partners, and family crazy!! So let’s start with a story. Me: Good afternoon, this is Brandon Souba, how is your day going? Person: Brandon, great to hear from you! My day is good how is yours? Person: Brandon can you hold on I am at the bank. NO JOKE, after 6 min of being on hold, I hung up. The person did call me back and we completed the conversation, but has this ever happened to you? Another example, after the person has answered the phone, was “I am in a meeting right now and this is not a good time to talk.” If you are in a meeting, then why did you answer your phone?! Now, when I was in sales and doing follow up with a client, I get that not everyone was in “a meeting” and they probably didn’t want to talk to me. But most called me back after their meeting. I have some major advice for you in this Blog. Are you ready? Don’t answer your phone if you are not able to talk! 20 years ago I had a “teen” landline and an answering machine hooked up to it. I didn’t get back to my friends until I was home and in my room. We all had some sort of answering machine at our house and at our business. We all had to wait to hear back from someone after leaving them a message. Why now, just because we have our phones with us all the time, do we feel we HAVE to answer it when it rings? If something is that important, they can send you a text after a failed attempt to get a hold of you. This way you can see if you need to remove yourself and call the person back. Now there are exceptions to every rule, I get that. But how many days in a week each year are you on call? If you have a daycare or someone that needs to get a hold of you, save the contact in your phone so you know who it is. If a random number is calling you and you are sitting in a meeting, let it go to voice mail! We don’t need to put that pressure on ourselves to have to answer right then and now. To drive this all home let’s take a look at the callers prospective when you put them on hold or hang up with them right after you answer. When I was put on hold for 6 minutes, I got very frustrated. In all fairness the person I was calling may not have known how long it was going to be at the bank, but if you did this to a client, you may lose the business or the opportunity because you answered the phone and put them on hold for 6 minutes. I know when someone answers and tells me it is a bad time to call, I feel bad for calling them. Once again, if you make a client or member from your chapter feel bad for calling, what happens to your relationship with that person? They might have been calling to sign the contract or pass that referral and you made them feel bad for trying to help you out. What does it look like to the people in the meeting you stepped out of, or the cashier or bank teller you are talking to, when you just get on your phone? We have enough problems with people ignoring others because they are looking at their phone, but answering a call just to put the caller on hold still interrupts your interaction with the person right in front of you. Plus what if the person in front of you could be a possible referral for you or a fellow member. You won’t know because there was no engagement with that person. You have no idea what image you are portraying to the people right in front of you when you take a call, which very well could be taken care of at a later and more convenient time for both parties on the call. So please, think before you have that jerk reaction to answer your phone. Respect the people in front of you. Live your life in the now and remember the call can wait. Most of the time you will call the person back in a few minutes, and that is just as respectful to the caller as it is to not miss their call. When people call now a days, they probably expect a voice mail and will wait for you to call back. I know when I call a member and I don’t realize it is during their BNI meeting, I get excited when they don’t answer! That means they are respecting their BNI meeting and fellow members.